My 7 year old son handed me a list of words which all started with "th" and asked me to make a game for his speech teacher. Who could turn down a request like that? We've had fun with "R" and "L" Shout Out Games. It's a fun and easy way to 'practice' what he's learning in speech therapy without the monotony and frustration of flash cards. While we are scanning the cards looking for the match, we often practice saying the beginning sound. So, we get practice saying the sound alone and then in a word as we Shout Out the match. You could also play the game by using the word in a sentence. "I spy _________" I spy a thimble. I spy a thermometer. My preschooler also loves seeing a reviewing these games as he learns his letter sounds and begins to try to sound out words. 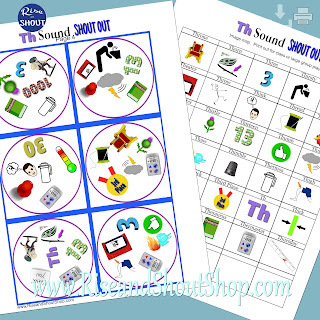 "Th" Shout Out is a great way to introduce the often confusing sound combination of t+h. He's given some of the other Shout Out games to his preschool teachers when they match the letter of the week. The kids love to have the game in their reading center. Teachers love that they can review and learn as they play. 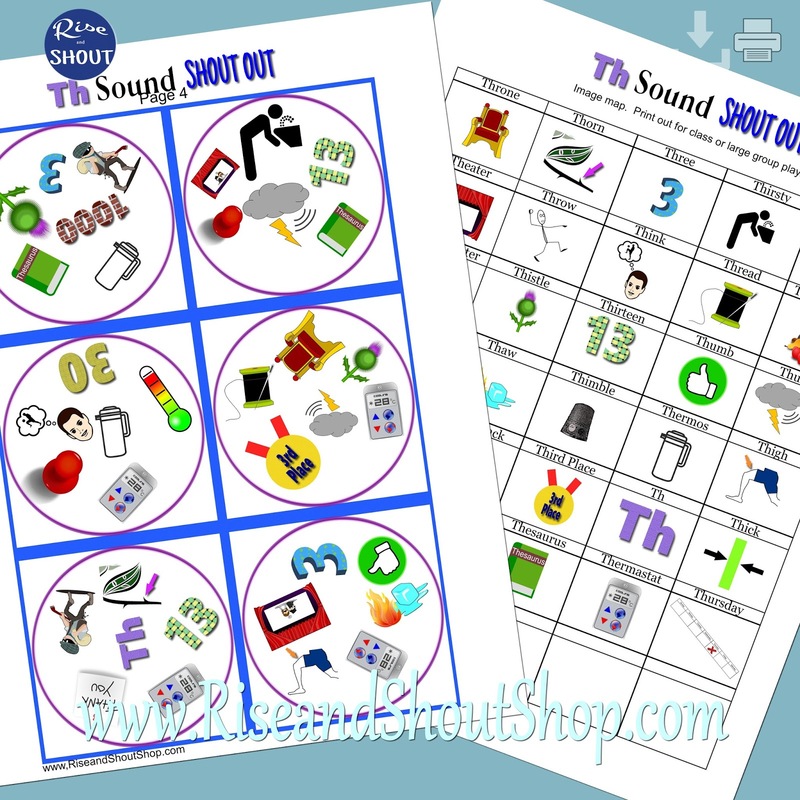 I'd love to hear what other ways you use Shout Out in your families, classes and therapy sessions. Do you only use it in the classroom? Do you make copies of pages and send it home to practice? Do the kids make their own games? Do you learn and review the sound of letters with an emerging reader? Or do you just play for fun for the whole family? Find Th Shout Out here.